After postponing the release date so many times and after convincing Varun Rajendran who made plagiarism allegations, ‘Sarkar’ movie unit has finally released the movie today on November 6th. The movie is getting moderately positive response from the audience but political party BJP in Tamil Nadu started slamming Vijay. Even when Vijay’s ‘Mersal’ got released, BJP has made a scene over some dialogues in the film and now they are doing the same with ‘Sarkar’ as well. 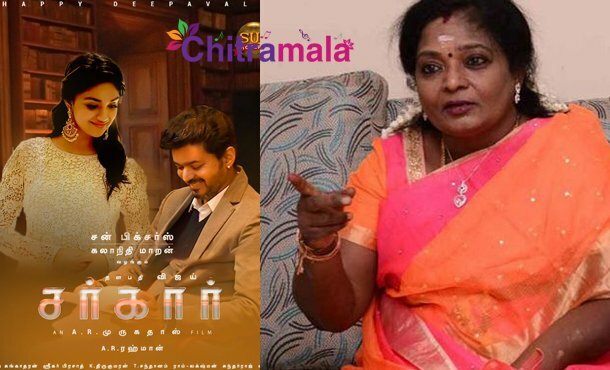 Tamilisai Soundararajan, BJP President made some shocking comments on ‘Sarkar’. She recently attended an event in Chennai as the chief guest. Talking at that event, she stated that some of the people who acted in movies are coming into politics to become Chief Ministers. But actors like them may become CM in movies but not in real life. The current political situations are very good and no one needs someone to change it.” Said Tamilisai. Though she hasn’t mentioned any names, it is evident that she targeted Vijay’s political drama ‘Sarkar’. The movie came out in the combination of Murugadoss and Vijay for the third time after ‘Tuppakki’ and ‘Kaththi’. Keerthy Suresh and Varalakshmi Sarathkumar played the female leads in the movie.